Tokyo, Japan -- Like Britain’s Queen Elizabeth II, the current Japanese emperor represents royalty in unbroken perpetuity, reformulated today into a fusion of timeless tradition and progressive democracy. And yet, the case of Japan is more complex, opaque and, at times, divisive. 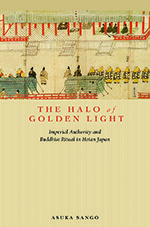 Asuka Sango’s estimable new book, “The Halo of Golden Light,” examines how Heian Period (794-1185) emperors appropriated Buddhist rituals to legitimize their authority, and the extent to which monks and members of the aristocracy co-opted Imperial symbolism to advance personal ambitions. Sango analyzes the mechanisms of the Emperor’s Misai-e Assembly - a body established to endorse an Emperor-centric system based on legal codes adopted from China - and the role of the Golden Light Sutra in promoting ideology through rituals. Clearly a title for the special interest reader, “The Halo of Golden Light” nevertheless provides an intriguing portrait of power during the Heian Period.